The brand doesn’t get enough credit for this, but Mitsubishi was the master of cheap thrills for years, and not only with their flagship Lancer Evolution. I own a 2010 Lancer GTS, not even an Evo, yet it’s provided hours of fun blasting down back roads, going to the track, and even some mild wrenching. My tendency to hoon the crap out of that car—continuously variable transmission and all—may even be responsible for my job at Jalopnik. My early-2000s high school parking lot was filled with similar fare from other automakers: Integras, Corollas, Civics and the like. Some were modified, and others merely appreciated for what they were. These compact cars that were fun to drive but not out of reach for the average young person were gateways into automotive enthusiasm for many people my age. They made you want to spend more time with cars. That’s what makes me so angry about Mitsubishi’s move to an almost all-crossover lineup without any kind of sport compact to replace the Lancer. No one is going to drive something like the Outlander Sport and get excited about cars. Few would ever talk excitedly about the little mods they did to make it better to drive, or a good driving road they discovered in it. Mitsubishi’s whole corporate direction at the moment seems to assume that automotive enthusiasm is dead and not worth reviving. And believe me, I understand the realities of the market and making vehicles in line with what people are currently buying. I get that. But it’s not unfair to wonder what we’re losing in the tradeoff. I had high hopes when I drove the Outlander Sport—perhaps too high. The Outlander Sport shares the same 2.4-liter inline-four engine and CVT from my Lancer GTS and was even built on the same platform. But that butter-smooth, step-free CVT and adequately torquey, zippy four-pot were the Outlander Sport’s only redeeming qualities. The rest of it is so far off the mark for what even a Bland Human-Moving Conveyance For People Who Don’t Care About Cars should be that ranks it among the worst cars I’ve driven. The Outlander Sport has the same gauges and central display as my seven-year-old Lancer, so at least it looks familiar, I guess. The problem isn’t with the Outlander Sport’s engine or transmission. The 2.4-liter, 16-valve, dual overhead cam 4B12 engine under the hood is still a decent little powerplant. The MIVEC variable valve timing system gives it a bit of extra grunt at higher revs. It gets the job done. The continuously variable transmission whirs up like a tornado of angry bees, but makes it easy to control the revs of the engine with the position of your foot. There are programmed in fake gears to use with the paddles, but they’re sort of pointless here. Sure, the CVT may rob a bit of power from the engine, but it’s your only choice and quite frankly, one I’ve grown to prefer over a less smooth traditional automatic. No, the Outlander’s worst sin is that it feels as if entire platform was lifted with all the grace of a poorly designed eBay lift kit. It has an incredible amount of nose-dive and lift when braking and accelerating, but that front-to-back pitch isn’t matched by the amount of body roll from side to side. The Outlander Sport feels weirdly upright in corners in comparison to its behavior under braking, which doesn’t inspire confidence at all in the Outlander Sport’s cornering abilities. Despite being higher in the air and clearly made for a less enthusiastic driver, its ride is also annoyingly harsh on bumps. It’s front-wheel-drive, so it does understeer and torque-steer a bit, as you’d expect. Steering itself is light with less feel compared to Mitsubishi’s older cars. Worse yet, this test vehicle had a slight but annoying vibration in its steering at highway speeds. My Lancer only had a similar vibration to this after its front wheel was hit when it was parked. Perhaps our test car was out of alignment, or had suffered at the hands of some previous driver. I let the company that manages our regional press fleet know about the issue but have not received an explanation for why it would do that. Even the driving position was bad. While I’m admittedly short (5'4"), I found that the dead pedal was bizarrely tall, and for me to be close enough to reach the brake and gas pedals, my knees kept hitting the steering column. I realize that many crossover buyers feel good sitting up tall “where they can see,” but the visibility out of this thing was so poor all over that it didn’t justify the awkward seating position. It was so hard for me to tell where the edges of this car were that I kept worrying that I was going to hit my neighbor’s cat because I couldn’t see over the car’s nose. 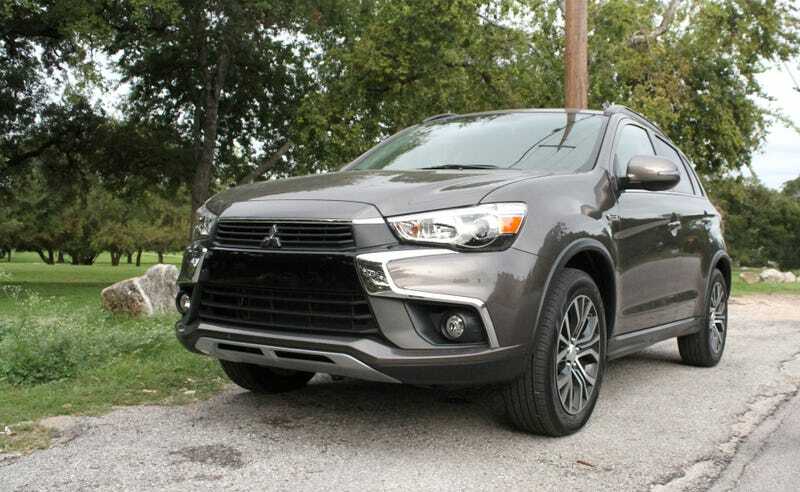 The Outlander Sport lacks the helpful systems that make many other crossovers bearable, particularly those that beep when you’re in close proximity to things you don’t want to hit, like children, pets, large rocks or ornamental brick fences. Thank goodness it at least had a backup camera, as the rear visibility is just as miserable. The Outlander Sport does have one thing that many other crossovers don’t, however. An irritating “Eco” light (which you can’t disable) will flash as if something’s wrong with the car when it thinks you’re driving well, perpetually annoying you in your peripheral vision. Granted, some people just want to be comfortable. A car that doesn’t have to be that engaging to drive if most of its life will be in miserable traffic. “Coccoon me away from the sick, sad world” is my attitude towards tow vehicles and opulent luxury sedans, after all, not to mention a major selling point for many crossover buyers. The Outlander Sport was bad at that, too. Something terrible seems to have happened to Mitsubishi in seven years. My Lancer’s interior is plasticky but adequate and functional. Things inside the new Outlander Sport—despite it being the higher SEL trim that comes in at $25,090 (MSRP plus destination fees)—felt flimsy and cheap in comparison to my seven-year-old car. The transmission knob, for example, felt unnervingly light and hollow. The armrest didn’t lock solidly in place, either, and it kept sliding around to great irritation. The interior design is frumpy at best, with miles of dull black plastic and few contrasting bits to break it up. That’s forgivable in a Caterham or something that’s built for fun, but not so much in a crossover. What little ornamental trim was there was awful smudge-prone gloss black. You’d expect the radio to work well enough to salvage this experience somewhat, as the Mitsubishi name seems to sell more electronics than cars in the United States, but no! Not only do the graphics appear to be from 1995, but the sound was bizarrely tinny no matter how I adjusted it. Again, what happened to Mitsubishi in the past seven years? My Lancer’s stereo was fantastic for a default sound system for a car at that price. The leather seats themselves had the cheapest, most plasticky feeling leather I’ve ever encountered in a motor vehicle. Cloth, no doubt, is the better option. The lumbar support and seat heaters were nice, but the side bolsters—like so much else inside this car—just felt flimsy and inadequate. To add insult to so many injuries, a brand-new, completely unmodified Outlander Sport SEL comes with cheesy Autozone-grade tack-on side-vents on the front fenders. Why? I mean, why? Really, why? Has no one told Mitsubishi that this kind of thing is tacky and bad, not to mention kind of played out by now? Why didn’t it come with Truck Nutz instead? If you’re picking from the list of bizarre automotive stick-ons, Truck Nutz at least make me laugh. It’s a line that makes me gag every time I hear it: America wants crossovers. Many of our favorite small enthusiast cars are being kept out of America in favor of more stupid crossovers. The brands are just giving us more of what sells, they say. But if automakers adopt the Outlander Sport’s cynical approach to building crossovers, then where are the next generation of automotive enthusiasts even going to come from? Not here. And we’ve seen what happens when you lose your soul to chase the market. Ask Honda how that went for them. Fortunately, it doesn’t have to be this way, even with a crossover. Mazda actually made their relatively inexpensive CX-line of crossovers shockingly fun to drive in spite of their taller stature. A CX-3 is a great alternative to this. Even Toyota’s smaller, number-feeling CH-R isn’t too terrible, although it could use a 4B12 swap for more power. I’m not just mad. I’m disappointed. You can do better than this, Mitsubishi. Believe me, I wouldn’t be holding onto a seven-year-old Lancer if I didn’t know.